Close up portrait a yorkshire terrier dressed in wool sweater walking with the owner outdoors. Teenager and a dog in a winter snow-covered park together. Slow motion. Portrait smilling cute girl with long hair hugging a yorkshire terrier dressed in wool sweater holding dog on hands in a winter snow-covered park. Teenager and a dog on a walk outdoors. Snowing. Portrait lonely cute girl with long hair hugging a yorkshire terrier dressed in wool sweater holding dog on hands in a winter snow-covered park. Teenager and a dog on a walk outdoors. Snowing. 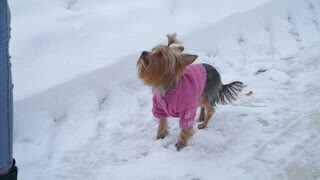 Close up portrait a yorkshire terrier dressed in wool sweater walking with the owner in a winter snow-covered park. Teenager and a dog outdoors together. Slow motion. Portrait cute young girl with long hair kissing a yorkshire terrier dressed in wool sweater holding dog on hands in a winter snow-covered park. Teenager and a dog on a walk outdoors. Slow motion. Woman stands with her back to camera, holding small yorkshire terrier covered in towel. Teenager and a dog on a walk outdoors.